Back in Daytona I had girls night every Wednesday night with my best friend Keri. Many times other friends joined us. We would either go out for dinner and drinks or cook at home watching movies or crappy reality TV. It is a pastime I miss terribly. Keri and I always get together when I am in town but it isn't the same. Next weekend, Keri is coming into town to run the Flavor Run with me. She decided to come in on Thursday so we could have some more time together. I was planning out our 3 days in Tampa when I heard about a promotion at the Trop that I could not pass on. 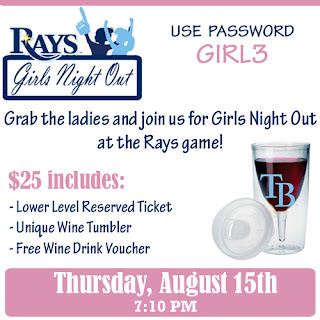 Tropicana Field is hosting a Girls Night Out on August 15th!! 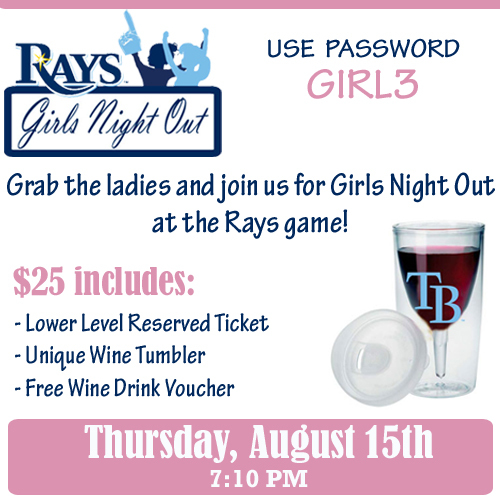 For $25, you will get a lower level reserved ticket, a unique wine tumbler and a free wine drink voucher! This is an incredible deal. At first, I was unsure if Keri would go to the game. Unlike me, she did not grow up watching baseball and has never been to a MLB game. 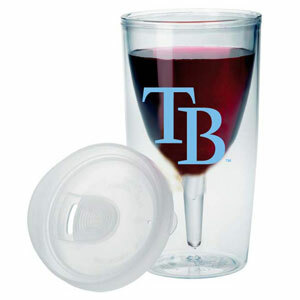 I sent her a photo of the wine tumbler and she instantly agreed and asked me what color shirt she should wear to the game. This will be Keri's first MLB game! The lower level tickets are normally priced at $45. I own one of the wine tumblers (without the logo), which I paid $15. AND you get a glass of wine. You cannot beat this deal! Click here to reserve your tickets today. They are limited so do not wait until last minute! Use the password GIRL3 at checkout!